Demand the Army Corps reject the pipeline! Apr 10, 2016 — The EPA has now recommended that the Corps prepare a second environmental assessment and complete an Environmental Impact Statement for the entirety of the pipeline. They have also recommended that the Corps open a 2nd public comment period. This is good news. Keep up the pressure on the Corps to follow through. Our allies at ICCI have composed a petition to demand this second public comment period and public meeting. Please sign and share. We need a full Environmental Impact Assessment that leads to no pipeline! The only thing preventing Dakota Access from beginning construction on the Bakken Pipeline is the Army Corps of Engineers (ACE) permit. Tell the Army Corps to deny the permit and conduct a full environmental impact statement today! In light of a recent victory for our Native American brothers and sisters fighting the pipeline in the Dakotas – three federal agencies have written letters telling ACE to do a more thorough environmental impact study before granting their permit for the Bakken Pipeline. Click here to read the letters. EPA , DOI , ACHP. But, the recommendation for an environmental impact study is limited to the areas where tribal lands are directly impacted. It is impossible for the ACE to grasp the true consequences of this toxic project if they consider it piece by piece. Take Action Now: tell the Army Corps they must consider the entire pipeline and ultimately reject the permit! 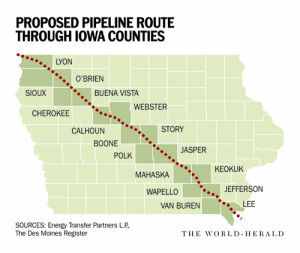 This entry was posted in Bakken pipeline and tagged #nobakken, Bakken Oil Pipeline, Dakota Access Pipeline, Environmental Impact Statement, Iowa oil pipeline. Bookmark the permalink.